Cool off in the pool after a long day exploring the theme parks. Lounge in the hammocks and stare at the blue sky. Play a few rounds at the resort's mini golf course with the family. Spacious kitchens give you the freedom to cook a meal in your residence. Kids will love the exciting dinner show, fun pool, and mini golf. All residences have balconies, perfect for enjoying the view. 2- and 3-bedroom condos have jetted tubs – sit back and let the massage jets work their magic. Grande Villas Resort by Diamond Resorts is less than ten miles from all of the area’s best theme parks. Once you get settled into your condo, get changed into swimsuits, grab goggles and pool toys and get everybody sun-screened up before heading to the outdoor pool – it’s shaped like a turtle! Little ones will love the kiddie pool. Resort guests receive access to the Volcano pool with waterslides located at sister resort, Cypress Pointe Resort. Back at Grande Villas Resort, there are daily activities for adults and kids. Get in touch with your inner athlete at the basketball, tennis and volleyball courts while the kids go wild in the game room or on the kid’s playground. Thinking burgers for lunch? Recruit the kids to help carry side-dishes and condiments and head for the outdoor grills. Once everyone is done eating, head for the on-site nine-hole mini golf course for a friendly game. Studio and one-bedroom condos sleep four guests. A family field trip to the on-site convenience store or the nearby Winn Dixie is definitely in order – your full kitchen won’t stock itself. Recruit the kids to help bake your famous double chocolate brownies (not that they’ll need convincing). Flatscreen TVs with Cable and DVD players are perfect for catching a Friends rerun or for family movie night. Bring favorite movies from home or browse the selection of DVD rentals available at the resort. Pop some popcorn and call everyone into the living room. First kid on the couch gets to choose the movie. Two- to three-bedroom condos sleep six to eight guests and include in-suite washer/dryers, allowing you to save space in your suitcase (more room for souvenirs!) Once the kids are in bed, enjoy a relaxing soak in the jetted tub. Now the only question is: red wine or white wine? Gather all of the shopaholics in your crew and head to Disney Springs, featuring a variety of shopping and dining options. Shops include Kate Spade New York, Pandora Jewelry, Tommy Bahama and Sephora. Little ones will love World of Disney, The Lego Store and Build-a-Dino (by Build-a-Bear). Surprise your little princess with a makeover at the Bibbidi Bobbidi Boutique. Any left-handers in your party? They’ll have a blast at Lefty’s: The Left Hand Store. It features a variety of products made with lefties in mind. 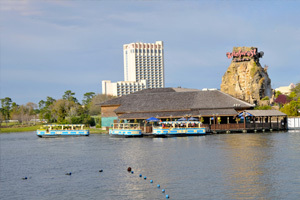 When you get hungry, head to Rainforest Cafe, House of Blues or Blaze Fast Fire’d Pizza. Don’t forget dessert: Sprinkles for cupcakes or Ghirardelli Ice Cream & Chocolate Shop. Get your caffeine fix at Starbucks – there are two locations. SeaWorld features rides, shows and animal experiences. Fly like a manta ray on Manta, ride Mako; it’s Orlando’s tallest, fastest and longest rollercoaster. Little ones will love Shamu’s Happy Harbor; it’s a rollercoaster that is kid-friendly. Shows include Dolphin Days, and Ocean Discovery (featuring orca whales). Check out Pets Ahoy. It’s a fun show for the entire family that features common house pets: dogs and cats and some not-so-common house pets: ducks and doves. Movie lovers will have a blast at Universal Studios. Race through New York with Jimmy Fallon, go on an adventure with E.T., or ride through Springfield with The Simpsons. Visit The Wizarding World of Harry Potter® to get your own wand, try butterbeer and ride the Hogwarts Express (with a park-to-park ticket). Universal’s Islands of Adventure® allows you to come face-to-face with dinosaurs and King Kong. Experience The Amazing Adventures of Spider-Man®. You’ll find even more magic at Walt Disney World’s® Magic Kingdom® where you can party with 999 happy haunts, rock out with the Country Bears, cruise the jungle and even dine in The Beast’s castle. Please note that cash is not an accepted form of payment. Pool Details: Pool hours are from 8:00 am - 11:00 pm. All pool decks are non-smoking. Housekeeping is available for an additional fee. Extra-person charges may apply and vary depending on hotel policy. Guests must provide a credit card at check-in to cover the required damage deposit. The deposit is refunded after guestrooms have been inspected following the guest's departure. If damage or missing items are discovered, guests will be charged.